The lofty-minded centrist columnist thrilled by the low-road campaign against Trump--for now. Mitt Romney’s speech on Trump yesterday made David Brooks a very happy chappy. Now, at long last, the big guns are being brought to bear. Now, at long last, some major Republicans like Mitt Romney are speaking up to lay waste to Donald Trump. For months Trump’s rivals and other Republicans have either retreated in silence or tentatively and ineptly criticized him for exactly those traits that voters like about him: for being a slapdash, politically incorrect money-hungry bully. It’s unpleasant to have to play politics on this personal level. But this is a message that can sway potential Trump supporters, many of whom have only the barest information on what Trump’s life and career have actually been like. It seems Brooks wrote this column before last night’s candidate debate in Detroit. But you can easily imagine him cheering as Marco Rubio hit Trump on many of the same issues he cites in his column — the Trump University shuck, the hiring of foreign workers for his bigger projects, the bad faith displayed against investors during his companies’ bankruptcies, and on and on. He may not have been as excited by Ted Cruz’s more ideological and partisan indictment of the Donald as a crypto-Democrat and godless liberal — Brooks is above that kind of stuff — but when you are waging total war against “the great betrayer” — the term for Trump in the column’s headline — I guess any tactic is fair enough. But you can also imagine Brooks’s cheers ending abruptly during the final round of questions at the debate when Rubio, Cruz, and John Kasich all dutifully lined up and vowed to support Trump if despite their efforts he wins the nomination. Indeed, it’s increasingly clear the Great Anti-Trump Cabal — the very Republican conspiracy Brooks called for — could fade into nothingness in ten days if Trump croaks the candidacies of Kasich and Rubio in Ohio and Florida, respectively. Perhaps they will find a reason to sojourn on to the convention and try to outmaneuver Trump there, but in the end their idea of “saving” the GOP requires supporting its nominee no matter what. 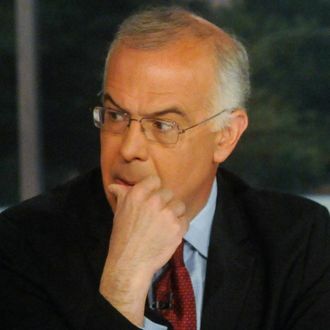 And for David Brooks, that could be the greatest betrayal of all.